A day after launching the doorstep delivery of services scheme and receiving an overwhelming response from the citizens of Delhi, Chief Minister Arvind Kejriwal announced on Tuesday that as many as 100 public services will be brought under the governance initiative by the end of this year. Currently, the scheme offers 40 odd public services. The Chief Minister said 30 more will be added by next month. The doorstep delivery of public services scheme was launched in the capital city on Monday and it received an overwhelming response from Delhilites with 559 appointments registered by the end of the first day. 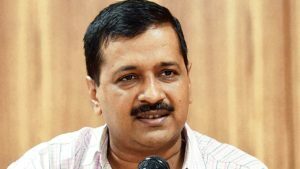 Chief Minister Arvind Kejriwal has asked officials concerned to increase the number of facilitators and phone lines for the scheme, which saw 224 appointments being booked for services that fall under the revenue department on the first day. Although there is no official data for stating the most favoured service, citizen booked 202 and 70 public services falling under the transport and food civil service departments. Officials said that of the 25,000 calls made by Delhilites on the first day, majority were inquisitive in nature.